The former garage site in East Boldon. Planners have put the brakes on a bid to turn an eyesore former car sales showroom – disused for a decade – into a hair and beauty business. They say the plan to transform the former Suzuki dealership in Station Approach, East Boldon, is not the right style of enterprise for the location. Instead they have suggested applicant Georgia Cotton move her business into a vacant unit in any of the borough’s major retail centres to boost trade there. Miss Cotton wanted to create a ‘one-stop’ shop of specialists who would come together to provide beauty services and treatments. These would include nails, waxing, eyelash extensions, micro blading, make-up, skin care treatments, laser treatments, aesthetics and spray tans. She currently operates a freelance business, visiting clients’ homes. Her application, which she claimed could have created 15 jobs, also had the support of demolition and dismantling company G O’Brien & Sons, which owns the land. But South Tyneside Council has rejected it, insisting it does not fit with their long-term development aims or other business plans for the vicinity. The plan also attracted criticism from anther salon in East Boldon, which said business could suffer from increased competition. Three residents also objected, stating 15 hair or beauty salons already operate within a one-mile radius of the garage site. In its report, the council said: “A number of objections have been received regarding the impact the development would have on the existing hairdressers, health and beauty premises within the East Boldon, West Boldon, and Cleadon areas. “The objectors consider there is already sufficient businesses of this kind in the area. “They are also concerned that the proposed development will put at risk the livelihoods of local people who currently have such businesses. 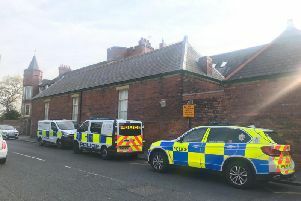 In addition, no evidence has been provided to justify that a unit of this size is required to provide a mixed hairdressers and beauty salon use. “There are a number of vacant units within the town and district centres and the proposed development may impact on the ability to bring vacant premises within those centres back into use. The East Boldon Neighbourhood Forum did not object to the proposal and admitted the site was an eyesore, but did raise the issue of the number of similar businesses locally. Two previous planning applications for the premises since 2010 have also fallen foul of planning guidelines.